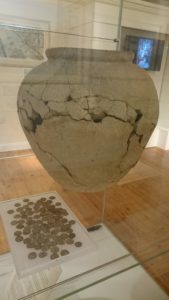 Over 100 coins from the Cunetio Hoard of Roman coins are now on display at the Wiltshire Museum – the first ever loan by the British Museum to the Wiltshire Museum. This year marks the forty-year anniversary of the discovery of the Cunetio hoard of 54,951 coins made at the site of the Roman town of Cunetio, near Mildenhall in Wiltshire. 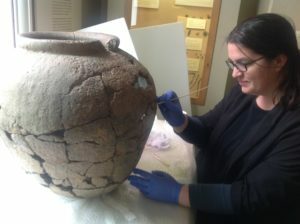 In 1978, after the find was made, the coins were deposited at the British Museum and the pottery vessel in which they were concealed was put on display at Wiltshire Museum, in Devizes. The largest hoard from Roman Britain, the Cunetio coins were buried in this large ceramic jar and a lead box. The hoard is mostly base silver radiates, which were produced in large numbers prior to the burial in around AD 274. Although the denarius was no longer widely used by the time the Cunetio hoard was buried, it contained a surprising number of these earlier silver coins. It seems that, like the Beau Street hoard found in Bath, Cunetio was sorted before being buried in its two containers. Unfortunately it was mixed before it could be studied and so we do not know exactly which coins were in which container. The location of the hoard just outside the town of Cunetio may hold a clue to its burial. The town was strongly fortified in the late Roman period and perhaps had some official role, for example in tax collection. Temples are also commonly found on the way into a town. More archaeological investigation is needed to understand the hoard’s findspot, which was close to an area excavated by Channel 4’s Time Team in 2009. Museum Director, David Dawson, said “Our new exhibition galleries now meet the standard to take loans from the British Museum and other National Museums. With support from the Arts Council, our new Exhibitions Officer, Heather Ault, is working to develop an exciting special exhibitions programme over the next few years”.